Each week, my college level literature students are to write a 350-500 word critical analysis essay. It's week 3, and this is what one student submitted (it's actually longer and more coherent than the earlier papers from the same student), along with my response. I have had enough. Compare and Contrast the allegories of Everyman and Piers Plowman. Which one is easier to interpret?What criticism do they make of Medieval English society (if they do)? Do they both seem to view salvation in the same way? Explain your answer. Which one is easier to interpret? To me, it would be easier to contrast when interpreting this material, because of the humorous brightness, the laughter, and the light setting of this story. It was also; esteem to know that at this time, (year) that it was outstanding in those days. I am not sure and I could be wrong, but I did not fine any information stating if Medieval English made any criticism in society. I also, could be wrong about my first response to the question, but it was just what I thought. 2. How do you assess Margery Kempe’s personality as her book presents it? Give specific examples to argue for your view of her Character traits. Do you think it is falsifies our view of her personality if we only have excerpts from her book? I am not sure about my answer that I am about to give, but I goggled this information and this is what I found. It said that her personality was express through her spirituality and her body. Yes, I think it was false because it does not make any sense. Student Name, you said you wanted feedback for improvement. Okay, here goes. First off, how many times have I asked, through announcements, reminders, comments on papers, that you only answer one prompt? So first, do the minimum of doing what you’re asked. Second. I know this doesn’t seem to have any connection to the rest of your life, and here’s a big tip – it doesn’t matter. Just do the work – and that DOES have a lot of connection to the rest of your life. So, let’s say you were going to write about the second one. First, do not use Google to find your answer. First, read the material. Do you understand all the words? If not, use a dictionary to look them up. Do you understand the story? Read all of the supporting material in the Norton book. Do you understand the paper prompt? It tells you to use her writing to assess her personality. Does it matter that she didn’t write her book herself? Why or why not? So your job is to say to yourself, “Hmmm. What would I think of a person like this, if all I had was this writing?” Then – and here’s the exciting part – you outline your ARGUMENT, supporting it with quotes FROM THE READING, and you WRITE AN ESSAY with paragraphs that make sense and flow from one to another and make an argument. Say you think she’ nuts. So you make that argument, support it with evidence, and turn it in. When you do that, I’ll be able to give you feedback on what you’ve actually written, instead of telling you what you should have done. I’m happy to answer questions that are real – asked ahead of time, asked about the reading or the assignment, but I’m not throwing feedback into the void. I’m not going to spend another one of my precious work minutes on work that shows such lack of effort. Every week, my Early English Literature students have a short paper due -- 300-500 words. (1.) Compare and Contrast the allegories of Everyman and Piers Plowman. Which one is easier to interpret? What criticism do they make of Medieval English society (if they do)? Do they both seem to view salvation in the same way? Explain your answer. Which one is easier to interpret? To me, it would be easier to contrast when interpreting this material, because of the humorous brightness, the laughter, and the light setting of this story. It was also; esteem to know that at this time, (year) that it was outstanding in those days. I am not sure and I could be wrong, but I did not fine any information stating if Medieval English made any criticism in society. I also, could be wrong about my first response to the question, but it was just what I thought. (2.) How do you assess Margery Kempe’s personality as her book presents it? Give specific examples to argue for your view of her Character traits. Do you think it is falsifies our view of her personality if we only have excerpts from her book? I am not sure about my answer that I am about to give, but I goggled this information and this is what I found. It said that her personality was express through her spirituality and her body. Yes, I think it was false because it does not make any sense. Troy, you said you wanted feedback for improvement. Okay, here goes. First off, how many times have I asked, through announcements, reminders, comments on papers, that you only answer one prompt? So first, do the minimum of doing what you’re asked. So, let’s say you were going to write about the second one. First, do not use Google to find your answer. First, read the material. Do you understand all the words? If not, use a dictionary to look them up. Do you understand the story? Read all of the supporting material in the Norton book. Do you understand the paper prompt? It tells you to use her writing to assess her personality. Does it matter that she didn’t write her book herself? Why or why not? So your job is to say to yourself, “Hmmm. What would I think of a person like this, if all I had was this writing?” Then – and here’s the exciting part – you outline your ARGUMENT, supporting it with quotes FROM THE READING, and you WRITE AN ESSAY with paragraphs that make sense and flow from one to another and make an argument. And hey, presto, we've doubled our effective living space by finishing a third of the basement. 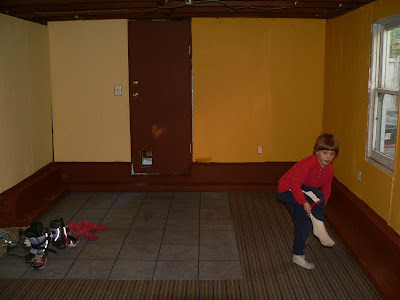 If you don't mind the lack of heat and not-quite-finished plywood walls, it's a playroom/movie room/computer room/office to die for. And think how much cooler it will be down there in the summer than the rest of the (uninsulated) house. The tile is there for a landing spot so maybe we can keep the mud from outside off of the carpet. We got cheap, nearly-industrial carpet from the nice carpet guys. 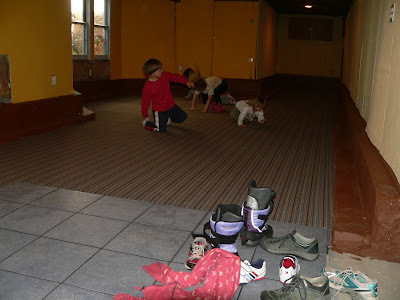 When we told them about our children, they started using words like "sturdy," and "hides dirt well." I'm thinking we need to hang some playground rings from the exposed floor joists, or someone is going to brachiate on the plumbing. And you all are the BEST. Tonight I'm going to set up little nicknames for everyone so when Stupid Blogger sends me a "donotreplyBloggercomment" email, I can email back and say thank you thank you. Tomorrow, I'm going to share one of my student's work with you. I'm completely flummoxed. During a wonderful visit with friends I see too seldom, Thing 3 now has a wonderful, yet cropped sweater with a pair of sleeves. Now all to do is go 'round and 'round the body and the hood. Note to self: saying over and over again, "I must buy two more balls of Cashmerino Aran to finish that hood," and yet not actually ordering them from anywhere does not the yarn procure. The disc there represents Thing 1 and her lovely Ultimate tournament today. Only intermittent rain, and unfortunately not enough light for crisp pictures. Definitely worth getting up in the wee hours for. Oh, and one other point! I love, love, love getting comments, and can't express how much I appreciate every single commenter. I really can't express it, because of the way Blogger sends comments on to me. Unless you have a link for emailing on your blog, I can't get a way to respond to you personally. I assume you know who you are. . . So anyhow, please send me your email so when you comment I can send a fawningly grateful (and hopefully funny) thank-you to you! People joke about being flighty, or absent-minded, or whatever. I don't tend to. If I forget things, it's because I'm well and truly overwhelmed with responsibilities, or something. Which brings me to the fruit flies. For the past. . .month, maybe? I'd get in my van, say a little prayer of thanks for it (I still love it very much) and set off on my way. Then I'd notice a fruit fly. Just one, usually. It would hover in front of me, and eventually at a stop or something, I'd squish it against the windshield and that was that. Then it dawned on me -- when I have fruit flies in the house, they're coming from somewhere. So I fuss at the children, insisting that one of them must have left an apple or something in the car and you know you're not allowed to eat in it, blah blah blah. Protestations of innocence all around. One day, Thing 1 said, "I bet it's the refrigerator." These van conversions have a little under-seat refrigerator, just big enough to hold a weekend camping trip's dairy, or some such. When I heard her, I just stared. The last camping trip was in October. Last week, I pulled the refrigerator out of the car and opened it up. Since October, a half jug of orange juice and something in a storage container had been merrily riding along with us, a haven for a colony of fruit flies. I've thrown the big stuff away, but haven't yet steeled myself to wash and bleach the rest. I hope the liquid sloshing around didn't break the fan and cooling unit. At least there haven't been any more fruit flies. Lots of in-house fun today. Painting the basement, going to yoga class covered in paint (we got up very early, but not early enough to eat, paint AND wash), and then picking out flooring for the nearly-done rumpus room down there. Afterwards, we treated ourselves (we were out grownups only) to a nice cup of coffee. And at Peets there were displays of tableware. Since having children, my priorities have changed, somewhat, and one of the things I put behind me mostly is a terrible craving for dinnerware. Plates, tea services, matching linens. . . I usually have it under control. I do this by reflecting on the fact that a) my children still break many things, and b) dinner time doesn't often resemble the fantasy portrayed in a Pottery Barn catalog and c) there is Time Enough for Such Things. But some things can trigger a flare-up. Peets had a nice set of tea/coffee things, with sort of a Polish folk design on them. Luscious colors -- deep blues and reds -- enough to trigger a horrible desire to just run out and buy a nice tea set -- a red pot! Matching cups! Maybe. . . saucers. When I came to, I was clutching a sticky bun and remembering that my children are, at this very moment, in exile upstairs until-it-is-clean-and-I'm-not-kidding. The other realization that hit me, thinking about carpet and paint and deep, enticing colors of tea pots, was that I'm not that permanently attached to many things. The broad outlines are the same -- I still tend towards comfortable, sporty, outdoor clothing -- but the particulars change. When I spied a sweet young thing wearing a pair of Monkey Boots, black leggings, a wee black skirt, a wool coat, and Serious Librarian glasses, I saw me in graduate school. I don't think it's a look I can still pull off. I bet I wouldn't even like the same tea pots any more, assuming that I had the kind of life which allowed me to indulge every lustful whim towards ceramic and cloth. I don't know if I still like my wedding china, because I'm afraid to take it out. So while I'm still recognizably the same person, the most external expressions of me change. Bringing me to why I don't have a tattoo. There isn't anything I can commit to long enough to want it inked under my skin. I know some people have their children's names tattooed on them, and I think it's fine, for them. Me? I'm way too aware of what skin does as it ages. Plus, I also don't carry pictures of my children. There's no question at all that they are central to my life -- in essence, their names are burned into me, inside. I don't need them anywhere else to hold them in my heart. I'm also aware of what time does most cruelly to memories in some cases. When my grandmother died, she was alone in the world, even though she was surrounded by her children. Her mind had left them behind in another iteration of herself. She was well-cared for, but she was profoundly alone. If this happens to me someday, having names on my ankle or bicep isn't going to remind me of where I misplaced those relationships. I plan to stay pretty much the same me. I plan to keep loving but not indulging in table thingies. I plan to keep knitting, even though the thought of One More Sleeve right now is killing me. I'll get there, even if I'm not willing to permanently ink a pair of circular needles on me. Actual fiber things have been happening here. Not, of course, as much as I would like, life having sped up most distressingly. In fact, as I look at my weekly calendar, I see that there isn't a lot of room left in my cleaning, cooking, driving, and working duties for things like "working out" and "knitting" and "spinning." Fortunately, I have managed to slip in some "lying in the bath reading dopey mysteries" as well as some "wandering around sipping tea." But those aren't as exciting to photograph -- like I would put a picture of me in the tub on my blog. 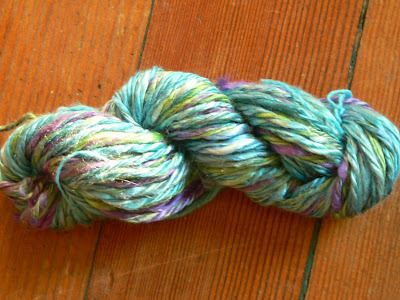 Some navajo-plied silk, in the Lake Berryessa colorway from Lambtown. I lost the wire yarn guide for my spinning wheel, and discovered that while wiring one's wedding ring to the flyer with a twist-tie does work in a pinch, having the part would work much better. And wouldn't you know it? A sock's worth of Finn top jumped in my online shopping cart when I bought a new one from The Woolery. I discovered this morning that I'm 2 1/4 stripes from finishing that sleeve. Striped sweaters are the salvation of the countingly-challenged. But I'd better order a couple more balls of the Cashmerino Aran so I can make the requested hood. Boring pattern, but butter-soft. I think spouse and I are going to start getting up earlier over the weekend so by Monday I'll replace some of my "sleep" with "exercise." Even though I'll be tired, I like me much better when I remember to move the bod! Maybe it will free up some time for knitting, too. How many can you think up? When I was getting Things 3 & 4 in bed tonight, I lay there thinking of what I could be doing. I usually arrange my "to-do" list for the evening, or think about all of the stuff I have to do, or something equally karmically useless. On really good nights, I breathe deeply and smell my children's hair. (This, technically, is just the opening line of a section of a book) -- Mr. Leopold Bloom ate with relish the inner organs of beasts and fowls. And that's it. Pretty small potatoes for someone spending most of her life immersed in lit'rachure. Can you recognize all of them? How many opening lines live in your brain? 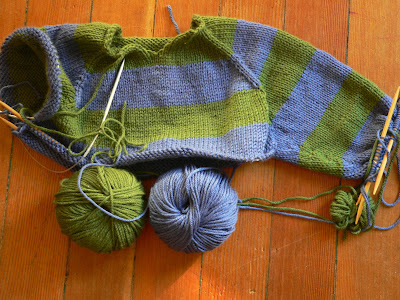 Oh, I'm at the arm division of another plain-vanilla-but-yummy-yarn top-down raglan sweater for Thing 3. I'm wondering if I should go back and add a few inches. 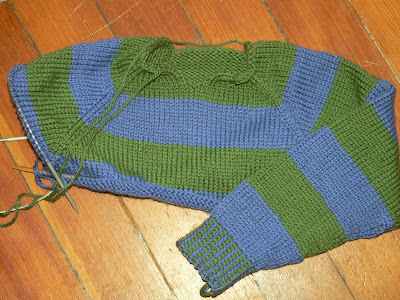 There's not enough yarn to do a hood anyhow, so I'm going to have to buy more -- might as well make it with room to grow. I'd be knitting on it but there's a cat sleeping on my forearms. I learned something new the other night, and wanted to run around the street telling people about it. Have you ever had the kind of experience when your brain goes, "Aha!" and it's just like getting that hard-to-reach itch properly scratched? Yep, that's what led me to graduate school. It's a terrific feeling. Unfortunately, graduate school offered few opportunities for scratches like that, so I turned to fiber instead. After reading instructions and watching videos and thinking, "None of this makes any sense at all," my inner voice finally broke through and said, "Just try it." So I did. 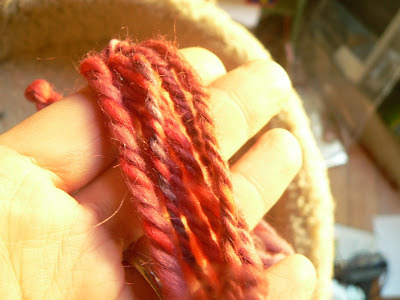 I Navajo plied. 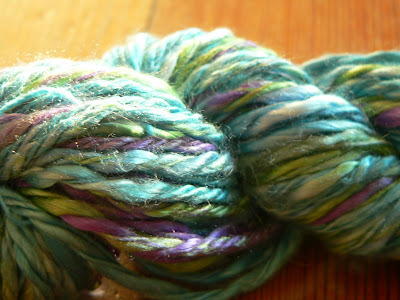 About a half-bobbin of old koolaid-dyed singles hanging around presented the perfect subject. The wheel seemed too fast, so I used my top-hook drop spindle and the slower speed plus parking it made managing the loops much easier. As I wound the yarn on, I gave the little cop a feel (snort) and it was incredible! Soft, squishy, springy -- just such a pleasure to hand. I can't wait to try it on some yarn with distinct color gradations. 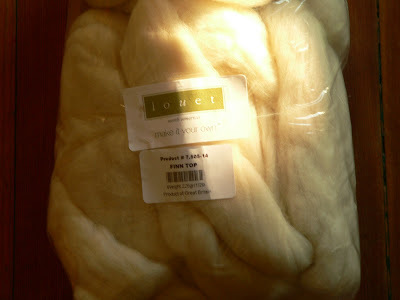 Maybe I'll have to dye some roving specifically for this. And this way madness lies, you see. But man, is it fun.